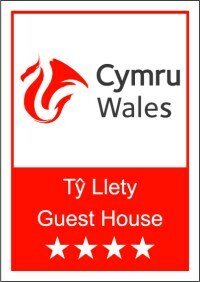 Beaufort Guesthouse has been awarded a 4 star rating by the Welsh Tourist Board. A four star rating is awarded to accomodation that attains a "Excellent Quality" score in the overall standards of furnishings, service and guest care. 75% of the test scores are likely to be "Excellent" and better, with probably 10% of all scores "Exceptional". Very few scores will be less than "Very Good". Normally, no scores of "Fair" or "Acceptable".